Matthew Joseph Dallas (born October 21, 1982) is an American actor, best known for playing the title character on the ABC Family series Kyle XY. Dallas was born in Phoenix, Arizona, and attended Arizona School for the Arts. He has two younger brothers and one younger sister. He became interested in acting at the age of 12, when his grandmother took him to a production of the play The Ugly Duckling at a local community theater called Desert Stages Theater. Dallas has starred in several films, and has played the title character in the ABC Family television series Kyle XY for three seasons. The series ended on March 16, 2009 after it was canceled by ABC. Dallas also appeared in Camp Slaughter (2005), Living The Dream (2006), and Babysitter Wanted (2008). He has been a guest on the TV show Entourage. In 2004, Dallas starred in Fan_3's music video for "Geek Love". In 2005, Dallas starred with Mischa Barton in James Blunt's music video for "Goodbye My Lover" and in 2008 he starred in Katy Perry's music video for "Thinking of You". Dallas was cast in ABC's Eastwick, playing Roxie's (Rebecca Romijn) love interest. On November 9, 2009, ABC declined to order any additional episodes of Eastwick, effectively cancelling the series. In 2009, it was announced that Dallas would be appearing in the movie Beauty and the Briefcase with Hilary Duff. Dallas was in an indie western film called The First Ride of Wyatt Earp as Bat Masterson, which was released on March 6, 2012. In 2012, Dallas starred as Max in the musical love story movie You, Me & The Circus. He played the role of Bat Masterson in an action packed western movie Wyatt Earp's Revenge with Val Kilmer. He also starred as Lance Leigh in the Hallmark movie Naughty or Nice with Hilarie Burton. Dallas played the role of Scott Orenhauser in the indie sci-fi thriller film Life Tracker. Dallas had a recurring role in ABC Family show Baby Daddy, where he played Riley's (Chelsea Kane) love interest. In 2014, Dallas starred in the horror comedy movie Ghost of Goodnight Lane. In 2015, Dallas starred as Jake in the web series Anne & Jake. The series was released on YouTube on November 11, 2015. In 2017, Dallas starred as Declan in the drama film Alaska Is a Drag, written and directed by Shaz Bennett. He also starred as Frank Dean in the western film Painted Woman directed by James Cotten. In 2018, Dallas starred as pastor John in supernatural horror film Along Came the Devil. Dallas is openly gay. On July 5, 2015, he married musician Blue Hamilton, his partner of five years. On December 22, 2015, Dallas and Hamilton announced on their YouTube channel that they had adopted their two-year-old son, Crow. 2005 Entourage Male model Episode: "Chinatown"
^ "Matt Dallas Biography". Archived from the original on 3 December 2013. Retrieved 22 February 2013. ^ "Kyle XY Cast". www.buddytv.com. Archived from the original on 2015-10-03. Retrieved 2015-10-21. ^ "Matt Dallas - Movies and TV | LocateTV". LocateTV.com. Archived from the original on 2015-10-10. Retrieved 2015-10-21. ^ "Katy Perry music video (Matt Dallas)". Archived from the original on 2015-11-06. ^ "Romijn's New Series Heads To Dallas". TV Guide. 2009-03-16. Archived from the original on 2009-03-29. Retrieved 2009-03-22. ^ "First Look: ABC Family's Beauty & the Briefcase - Hollywood the Write Way". Hollywood the Write Way. Archived from the original on 2016-09-21. Retrieved 2015-10-22. ^ "Wyatt Earp's Revenge". www.rottentomatoes.com. Archived from the original on 2016-04-15. Retrieved 2016-05-10. ^ "Watch You, Me & the Circus () online - Amazon Video". www.amazon.com. Archived from the original on 2016-09-24. Retrieved 2015-10-21. ^ "Wyatt Earp's Revenge | Sony Pictures". www.sonypictures.com. Archived from the original on 2016-03-04. Retrieved 2015-10-21. ^ "Matt Dallas as Lance on Naughty or Nice (2012) | Hallmark Channel". Hallmark Channel. Archived from the original on 2015-11-18. Retrieved 2015-10-21. ^ "From the Set: The Sci-Fi Indie Feature Life Tracker - ComingSoon.net". ComingSoon.net. Archived from the original on 2016-03-04. Retrieved 2015-10-21. ^ "'Kyle XY's' Matt Dallas Heads to ABC Family's 'Baby Daddy' (Exclusive)". The Hollywood Reporter. Archived from the original on 2015-09-24. Retrieved 2015-10-21. ^ "The Ghost of Goodnight Lane – Cast". www.ghostofgoodnightlane.com. Archived from the original on 2015-11-26. Retrieved 2015-10-21. ^ "Time To Find A Web Series To Get You Thru Winter? Try One Starring Matt Dallas. | Instinct". instinctmagazine.com. Archived from the original on 2016-01-03. Retrieved 2015-12-28. ^ "Anne and Jake Web-series". Archived from the original on 2015-12-25. ^ "CAST". ALASKA IS A DRAG. 2013-03-18. Archived from the original on 2017-12-26. Retrieved 2017-12-26. ^ "CAST". PAINTED WOMAN. Archived from the original on 2017-12-27. Retrieved 2017-12-26. ^ "'Ted 2's' Jessica Barth, 'Kyle X/Y's' Matt Dallas to Star in Horror Movie 'Tell Me Your Name' (Exclusive)". TheWrap. 2015-04-01. Archived from the original on 2018-06-17. Retrieved 2018-09-13. ^ “Coming Out,” YouTube video, 12:58, posted by “Matt and Blue,” January 19, 2016, https://m.youtube.com/watch?v=40lHfho2LsM. ^ Hernandez, Greg (January 20, 2016). "Matt Dallas Shares Sweet Story about Coming Out to His Dad". Gay Star News. Retrieved January 5, 2019. ^ Rouse, Wade (2013-04-15). "Matt Dallas Marries Blue Hamilton: See the Wedding Photo". People.com. Archived from the original on 2015-07-09. Retrieved 2015-07-07. ^ "Matt Dallas Marries Blue Hamilton: See the Newlyweds at the Courthouse!". E! Online. Archived from the original on 2015-07-09. Retrieved 2015-07-07. ^ Mendelson, Will (December 22, 2015). "Matt Dallas, Husband Blue Hamilton Adopt Little Boy: Watch the Video!". Us Weekly. United States. Wenner Media LLC. Archived from the original on 2015-12-23. Retrieved December 23, 2015. 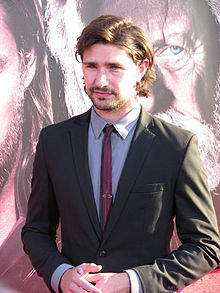 Wikimedia Commons has media related to Matt Dallas.